This study has 8 sessions, incorporating an introductory session and 7 lessons. The Study Set includes the Study Guide by Catherine Upchurch and a commentary, Women in the New Testament, by Mary Ann Getty-Sullivan (Liturgical Press). Mary Ann Getty-Sullivan holds an S.T.D. from the Catholic University of Louvain in Belgium. She has been teaching New Testament courses in colleges and seminaries for more than thirty years and has recently retired from teaching full time to devote more time to writing and lecturing. 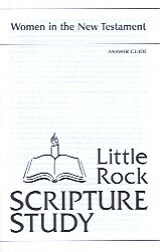 Mary Ann has written several commentaries on the Letters of Saint Paul. She is also the author of Parables of the Kingdom, Jesus and the Use of Parables in the Synoptic Tradition, ( Liturgical Press) which is the companion commentary to two Little Rock Scripture Studies, Parables of the Kingdom—Part One and Parables of the Kingdom—Part Two. This study of New Testament women engages with women across a variety of connections to Jesus and the apostles and studies them accordingly. Participants will encounter the strengths and needs of these women, but also how being a woman in the holy land during the time of Jesus and the apostles shaped many of the challenges they faced in responding to Jesus. Participants will enter into discussion and prayer about expectant faith, what it means to be touched by Jesus, and the meaning of discipleship through the lives of the women who lived in the first generation of Christianity.